The deposits within the Tucson Valley record at least 145 million years of geologic history. The Tucson Valley was formed by crustal extension beginning about 25 million years ago. That stretching transported a volcano across what is now the valley and those volcanics form the Tucson Mountains. Several times, the valley contained lakes, and at least twice it was buried in volcanic ash. For the story of how the valley formed, see my article: Tucson Mountain Chaos. Southern Arizona contains many deep alluvial valleys, with bedrock many thousands of feet below the valley floor.. 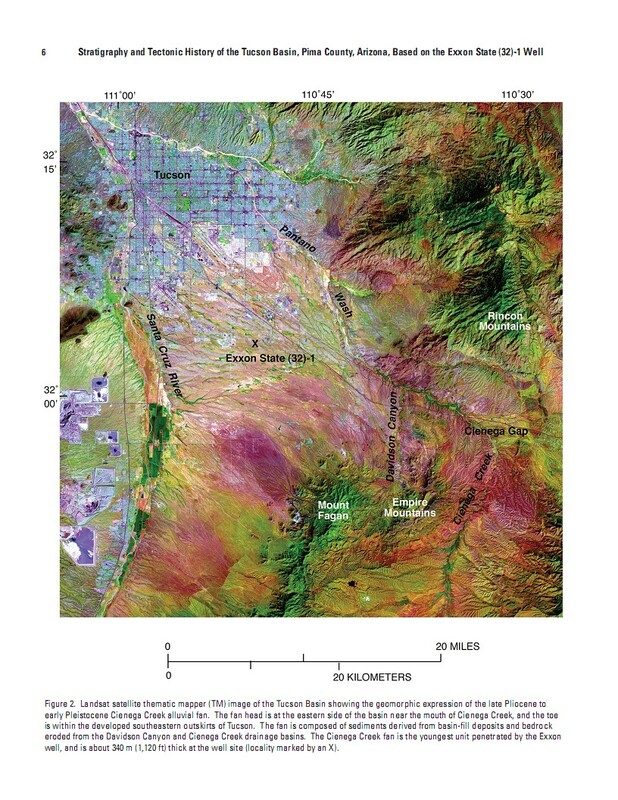 The Arizona Geological Survey has published a map, “Estimated Depth to Bedrock in Arizona” (DGM-52) which shows the valley patterns and depths statewide. In the case of the Tucson Valley, however, we don’t need to estimate the depth because in 1972, Exxon drilled an exploration hole which penetrated 12,556 feet and reached granite bedrock at 12,001 feet. (USGS Scientific Investigations Report 2004-5076).The location is shown on the Landsat photo below. Notice the linear, northeast-trending structures on the right side of the picture. These are large folds called synforms or synclines in the Catalina-Rincon Mountains metamorphic complex (see second graphic below). These synforms coincide with the deepest parts or sub-basins of the valley. The upper 1,200 feet of the valley contain unconsolidated gravels derived from alluvial fans that contain the aquifers from which we pump part of our water supply. There are deeper aquifers as yet unexploited, but the water in deeper aquifers becomes laden with dissolved salts and metals. There are several volcanic ash beds between 1,150 and 1,350 feet. Below 2,000 feet are remnants of playa lakes with deposits of gypsum. At 2,980 feet, there is a sharp boundary between the upper unconsolidated and undeformed alluvial sediments and denser, highly faulted basin fill indicating a change in tectonic style. The sandstones and siltstones from 2,980 to 3,840 feet are interpreted to represent deposits from a braided stream. Below that, to 6,170 feet are more alluvial fan deposits. The interval between 6,170 and 8,256 is called the Pantano Formation. It consists of alluvial deposits, lake beds, lava flows, and rock avalanche deposits. An andesite flow near the middle has been dated at 26 million years old. The avalanche deposits are similar to modern debris flows that occur on the slopes of the Catalina Mountains. However, the rock avalanche deposits in the drill hole are composed mainly of volcanic rocks that had a source east of the Catalinas. This evidence is consistent with the theory that the volcanics of the Tucson Mountains were transported from somewhere over or east of the Catalina Mountains. The interval 8,256 to 10,026 consists of Mid-Tertiary aged volcanic and sedimentary rocks. The volcanics include both lava flows and ash deposits. The interval 10,026 to 12,001 contain the Lower Cretaceous to Upper Jurassic marine sediments (sandstone, limestone, conglomerate) of the Bisbee Group (so named because it was first described from outcrops near Bisbee, AZ). In Bisbee, these rocks form the mountains at an elevation of 5,000 feet, but in Tucson they are two miles beneath the surface. Below the Bisbee Group is granite at least 138 million years old and more likely Precambrian-age, 1.4 billion years old. Even though the Exxon well went to 12,556 feet it did not reach the underlying detachment fault which transported the Tucson Mountain volcanics to their present position, probably because the detachment fault was itself offset by younger, steep faults bounding the valley. The detachment fault crops out along the Catalina foothills. I have so far described the rocks encountered in the Exxon hole from top to bottom, from youngest to oldest. So let’s flip things around and tell the story in chronological order. Paleozoic marine sediments were deposited upon Precambrian granites. Some time prior to latest Jurassic time they were eroded away (since they don’t appear in the Exxon hole but do appear in the surrounding region.) Beginning in latest Jurassic time and continuing through the Cretaceous, northeast-southwest extension created the Bisbee Basin into which the marine sediments of the Bisbee Group were deposited. There may have been some erosion along a sea shore as evidenced by coastal plain deposits. In mid-Tertiary time alluvial fan deposits indicate that surrounding mountains were eroding. These deposits are interspersed with lava flows. A violent volcanic eruption 26 million years ago deposited an ash in the basin (8,500 to 9,000 feet in the hole). By this time crustal extension was deepening the basin and accelerating denuding of the surrounding mountains and filling the basins with alluvial fan material, i.e., rocks and soil. Now, when we look out at the valley and see the city and the mountains, we see just a short slice of time in its history. And now you know what lies beneath the valley. Very interesting ! Some anecdotal stuff…one of my client water companies has drilled several wells in the vicinity of Palo Verde and I-10 and encountered a lake bed formation around 300 feet down. The aquifer permeability was marginal and there was clearly a lot more dissolve solids in the groundwater due to the evaporites from the lake bed. Apparently the Tucson Basin was a lot like the Wilcox area with playas and alternately lakes and then dry lake beds until a few hundred thousand years ago. And then there are reports that TEP sank a deep well at Irvington and Benson Highway and got hot water and brine at around 1500 feet. Over by Vail another client was proving its 100 year assured water supply and drilling wells. The ADWR assumed the Rincon Mountains bedrock formation slanted west but the well drilling found that there was at least a 2,000 foot offset between the bedrock under Cienega Creek and a little west of there…a major fault line. Then there’s the block of limestone that is home to Colassal Cave sitting on the side of the Rincons and similar chunks of limestone over on the east slope of the Tucson Mountains…I was trold by a geologists that when the Rincon formation uplifted, the Colossal Cave rock slide down the side. It cannot be assumed there is an ocean of good quality groundwater beneath Tucson. Thank you for posting this article. I printed a copy so that I can refer to it over the years.